The Book of Abraham is a part of the Pearl of Great Price, another book of scripture for Mormons. This book was translated based on different payri, while examining three different facsimiles. 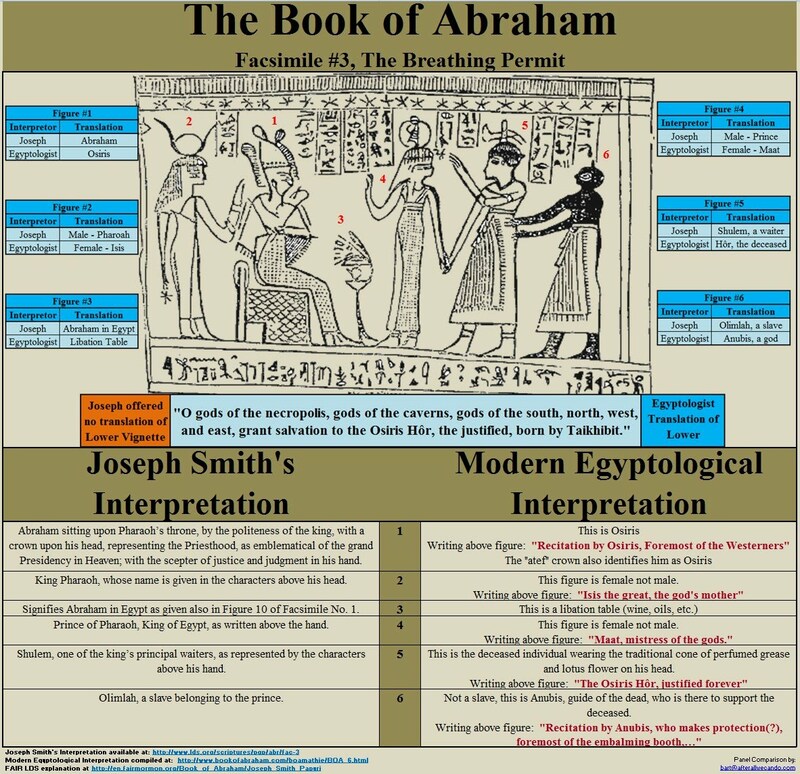 The official lds.org website says that the Book of Abraham was “translated from the Papyrus, by Joseph Smith.” Today, we will look more in depth at Facsimile 3, as it was greatly important for this book to come to completion. Based on this image, Joseph Smith was able to know more about Abraham and his time with Pharaoh. He was even able to sit on Pharaoh’s throne for a time. He was given a crown that “representing the Priesthood, as emblematical of the grand Presidency in Heaven; with the scepter of justice and judgment in his hand” (Fig 1). While on his throne, the pharoah himself stood behind him (Fig 2). In front of Abraham was a stand that “Signifies Abraham in Egypt” (Fig 3). The “Prince of Pharaoh, King of Egypt” was with him and pharaoh (Fig 4). While they were all in the king’s court, “Shulem, one of the king’s principal waiters” came to serve them (Fig 5). Lastly, “Olimlah, a slave belonging to the prince.” came to assist the water. This is a very interesting representation of Abraham and his time with Pharoah. It also sheds light on the importance of the priesthood and the grand presidency in heaven. But with all things, we must check to see if this is true. Fig. 1. Abraham sitting upon Pharaoh’s throne, by the politeness of the king, with a crown upon his head, representing the Priesthood, as emblematical of the grand Presidency in Heaven; with the scepter of justice and judgment in his hand. Fig. 2. King Pharaoh, whose name is given in the characters above his head. Fig. 3. Signifies Abraham in Egypt as given also in Figure 10 of Facsimile No. 1. Fig. 4. Prince of Pharaoh, King of Egypt, as written above the hand. Fig. 5. Shulem, one of the king’s principal waiters, as represented by the characters above his hand. Fig. 6. Olimlah, a slave belonging to the prince. Joseph Smith is a prophet in the Mormon Church, so it is very important to see if what he translated is true. And to help us come to that conclusion, 27 Modern Egyptologists have interpreted the papyri, specifically this Facsimile 3. After they finished, the results were in and it was startling as none of the previous translation made by Joseph to this facsimile matched the real translation. And this is what every Egyptologist, that examined it, has also confirmed. Let us get right into their findings. Examining this image again, we see Osiris sitting upon the throne, with a crown upon his head (Fig 1). While on the throne, a woman named “Isis the great, the god’s mother” was behind him (Fig 2). Directly in front of Osiris was “a libation table (wine, oils, etc. )” (Fig 3). Maat, the “mistress of the gods” stood before Osiris and Isis the great (Fig 4). While in their presence, a deceased fellow named Hor, who was ” justified forever”, came near (Fig 5). Lastly, “Anubis, guide of the dead”, escorted this individual to Osiris. For he “is there to support the deceased” and gives them their protection (Fig 6). What do we learn here? We learn that Joseph Smith’s Translation is wrong. None of the things that he mentioned was even found in the facsimile. The correct translation has to do with Osiris on the throne and not Abraham. The dead person is here, because this is part of the “Book of the dead”. Fig. 1. This is Osiris. Writing above figure: “Recitation by Osiris, Foremost of the Westerners”. The “atef” crown also identifies him as Osiris. Fig. 2. This figure is female not male. Writing above figure: “Isis the great, the god’s mother”. Fig. 3. This is a libation table (wine, oils, etc.). Fig. 5. This is the deceased individual wearing the traditional cone of perfumed grease and lotus flower on his head. “Writing above figure: “The Osiris Hor, justified forever”. Fig. 6. Not a slave, this is Anubis, guide of the dead, who is there to support the deceased. “Writing above figure: “Recitation by Anubis, who makes protection(? ), foremost of the embalming booth….”. There are many things to conclude about this misinterpretation of the papyri. The story of Abraham and his time with the pharaoh of Egypt is wrong. This was misinterpreted as Abraham when it was really the god Osiris. This means he did not receive a crown that represented the priesthood and there is no grand presidency in heaven. This is all very embellished as the “atef” symbolic crown identified the god Osiris. Joseph also interpreted two women as males, “Isis the great, the god’s mother”. and “Maat, mistress of the gods.” The stand did not signify Abraham in Egypt but was a table with wine and oil. There was no waiter but a dead person named Hor. He was not there to serve drinks but to be escorted in by his “guide of the dead,” Anubis. To call this man a slave is ludicrous and shows Joseph’s racism against blacks. These papyri’s are a part of a collection of funeral Egyptian texts. To conclude, it is obvious that Joseph Smith cannot be trusted. We know that he was not a true man of God but a false prophet. 1He has divining laid lies unto his people, “saying, Thus saith the Lord God, when the Lord hath not spoken.” Therefore, the Lord God has poured out his indignation upon him. He has consumed him “with the fire of His wrath”. Since Joseph, there are still false prophets among the Mormon faithful, 2“who privily shall bring in damnable heresies, even denying the Lord that bought them, and bring upon themselves swift destruction.” Come to the Lord, that you may not be led astray. And to Mormons, think upon these things and consider today to come to Jesus fully and leave the Mormon Church.